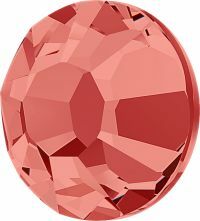 Silver Lining Flatback Rhinestones in PADPARADSCHA - a salmon-pink rhinestone color. Made in Austria, these lead free rhinestones offer a high quality crystal with stunning brilliance and sparkle! Perfect for Skating, Dancesport (Ballroom, Irish Dance, Jazz, Lyrical, etc), Equine Show Apparel, Accessories, Crafting and more! Easy to glue on! Be sure to see our full line of Glues and Tools for easier application! Flat back rhinestones are the best choice for figure skating dresses, costumes, leotards, cell phones, flip flops, clothing, western wear, greeting cards, scrapbooking, the possibilities are endless! VERY IMPORTANT: Please remember to order enough stones for your project as dye lots can very. Silver Lining Rhinestone stone colors are very consistent but slight variations can occur with different production lots. Please note, not all computer monitors have the same color settings. Size:40ss=8.41-8.67mm/0.33-0.34in.